In truth we went to the Museum of Archaeology and Anthropology because David and I thought we might like it. I suspected it might be a little dry for the children. This turned out to be partly true. It’s hard to get across to children aged 1 and 4 the intrigue of history (unless dinosaurs are involved, then it’s fine). After around half an hour they were more interested in running around and shouting. Much to the annoyance of the other patrons. We were given a very warm welcome when we walked through the door and immediately offered a range of activities. These included several drawing and writing activities. We picked the ones most suitable for the age of the children. Ted had a treasure hunt bag and May was given a bag with a story and soft toy. The treasure hunt was a big hit. He spent quite a while searching the display cases for a compass. There was only one treasure hunt in the pack but we found a bucket with other challenges on the first floor. Miss May went into tantrum mode as soon as we walked through the door. In a small, quiet museum on a school day (no other children in sight) this is every parents nightmare. As soon as we showed her the little bag with the book she cheered up and settled on a bench to read it. Phew! There were two colouring stations, one on each of the upper floors. So simple but it made us feel that children were welcome. There were lots of different pictures based on the exhibits. The downside is that I had to supervise Miss May as she tipped out the crayons then picked them up again. On repeat. Time to get round to talking about the exhibits. The lower floor was dedicated to local history. The cases focused on artefacts that had been dug up from around the county. These include the 1300 year old skeleton of a teenage girl and the gold cross she was buried with. The cross is known as the Trumpington cross and identifies the girl as an early convert to Christianity in England. We treasure hunted the Trumpington cross as well. As a reward Ted was allowed to buy the magnet with it on. I’ll admit, I did almost no research on the museum before we went. I checked the opening times and that was pretty much where my planning stopped. It was quite a surprise to step out of the lift to so many awe-inspiring exhibits. I don’t think I have ever seen a real totem pole before, they are quite something to behold. Such impressive exhibits couldn’t help but engage the four year old. Even if only for a short while. We only really managed to catch a glimpse of things but it whet our appetite to go back (without a 20 month old). I think Ted found it interesting and got something out of it. 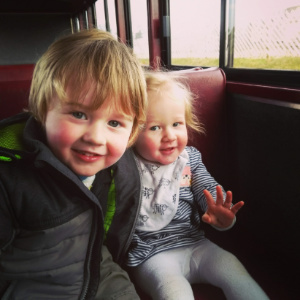 It’s certainly somewhere we will return to when they are both a little older. May (age 1) liked her story bag, tipping out crayons and running round the gallery. 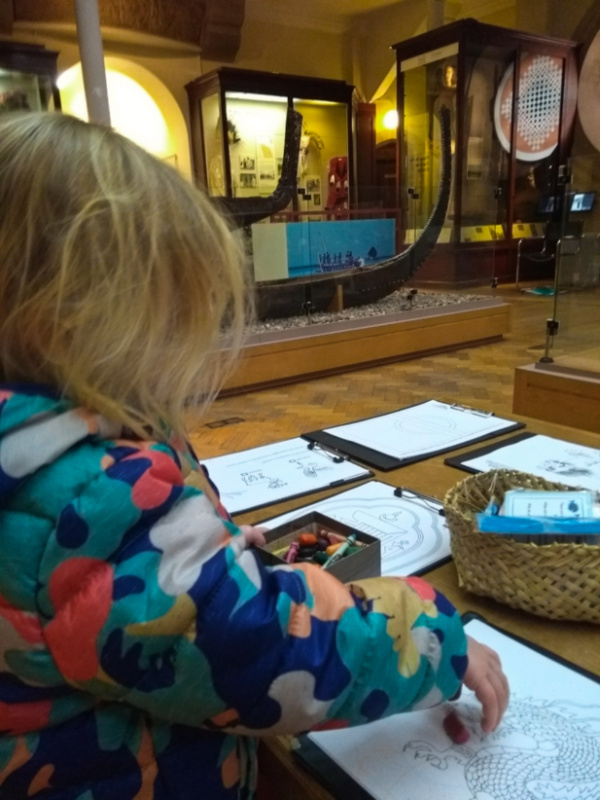 May did not like being told not to tip the crayons out, not to run around the gallery and that she couldn’t drink her milk in the gallery (by a well-meaning attendant). 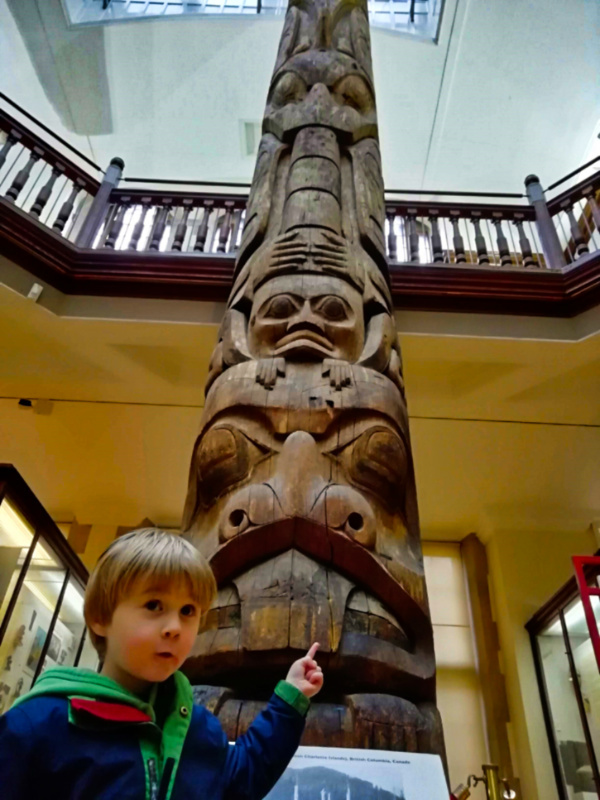 Ted (age 4) liked treasure hunting and the really big artefacts. Ted did not like being told not to shout and run around. 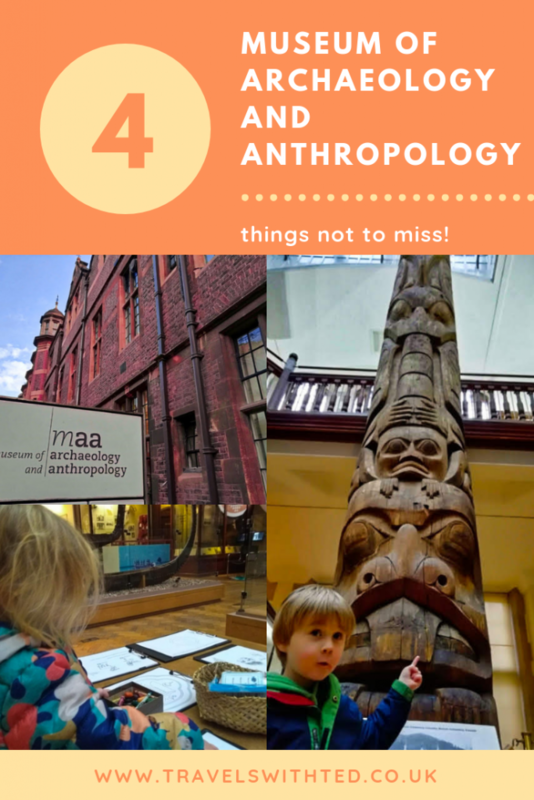 It’s completely free to visit the Museum of Archaeology and Anthropology. You can find it on Downing Street in the centre of Cambridge. It’s next to the Sedgewick Museum and opposite the Museum of Zoology. You can visit all three in one day if you fancy a museum marathon or you can take your time over each one. They are all worth a visit. 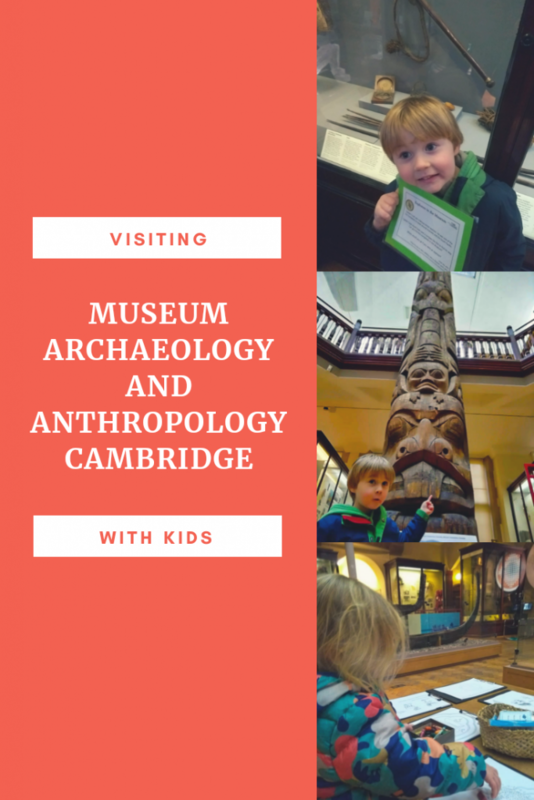 Find out more about the Museum of Archaeology and Anthropology on their website. Read more posts about Cambridge here. 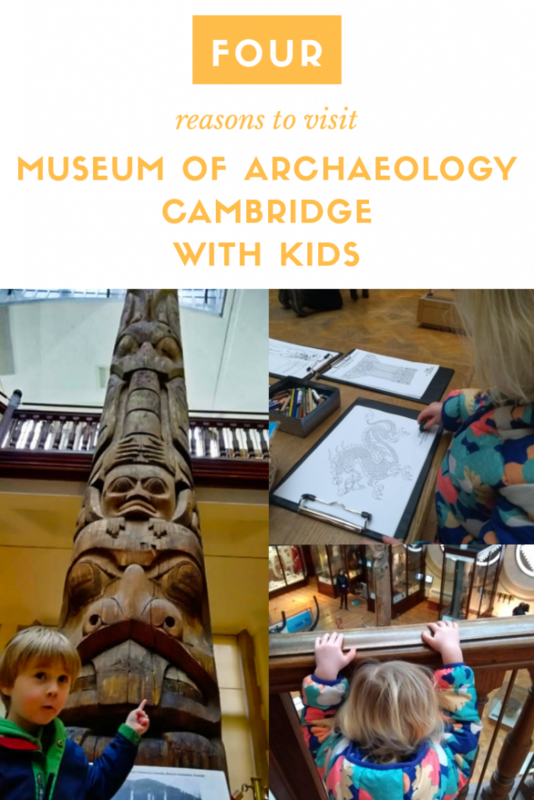 I’ve got lots more tips on visiting museums with kids in this post here.